Young businessman emotionally talks by smartphone, having problems. 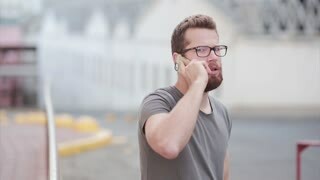 Guy with beard and glasses uses phone on the street. 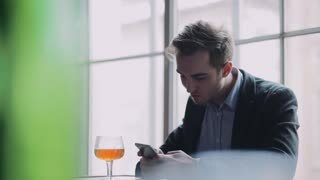 Attractive young man sits alone in the bar, uses his phone, takes photo, surfs the internet, takes a sip of the beer and is surprised with its taste. Having fun, social networks. Alcohol party. A young bearded strong man in sunglasses exiting the airport and using his phone, gladly smiling to it. Social networks, having fun. Successful lifestyle, luxurious wear. Close up teenage boy using digital tablet. Teen guy talking via internet. Online conversation concept. Children and modern technology.